Station Casinos’ newest resort, the $662 million Aliante Station, will be just the latest evidence of the direction “the company’s going versus where it’s been,” when it opens to the public Tuesday night, the company’s top executive said. The new North Las Vegas resort is the latest example of the locals gaming company’s continued evolution since it was started 32 years ago at today’s Palace Station, Station Casinos Chairman and Chief Executive Officer Frank Fertitta III said. The 46-year-old Fertitta said Aliante Station’s design started to take shape after the public’s positive response in April 2006 to the opening of the $925 million Red Rock Resort. “So many people seemed to have liked that direction we had gone (in),” Fertitta said. Although the new property has the same look and feel of Red Rock Resort, he said, it has been downsized for the area. The boutique hotel, at the corner of Aliante Parkway and the Las Vegas Beltway, will open with 202 rooms, compared with 800 now at Red Rock, and 14,000 square feet of meeting space. The 80,000-square-foot casino has 2,554 slots, 40 table games, a high-limit area and a poker room. The property, which is on 40 acres anchoring the Aliante master-planned community, is also bringing approximately 1,400 jobs to an area of Clark County suffering from high foreclosure rates and increasing unemployment. Fertitta said guiding the company during the current economic crisis has been one of the biggest challenges in his 15 years at the helm. Aliante Station and the company’s 17 other properties, however, are built and remodeled for the long-term, he said. Fertitta said despite the upscale feel, customers will find friendly pricing, including 1,500 penny games. 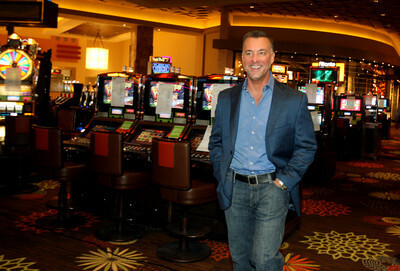 Aliante Station is the sixth property built in Clark County by Station Casinos since Fertitta took over the company in 1993 from his father and founder Frank Fertitta Jr.
Fertitta said grand openings of new properties always bring a sense of personal satisfaction and a sense of company’s continued accomplishments. “It’s always exciting and exhilarating to see something you’ve conceived from nothing, a clean sheet of paper, actually come to fruition,” Fertitta said. Fertitta, however, is especially excited about the new property’s restaurants. Aliante Station’s six restaurants are a blend of an old company favorite, company-owned restaurants and three new offerings. Pips Cucina & Wine Bar, the first restaurant by former Caesars Palace food and beverage director Rino Armeni, brings an extra buzz to the property for Fertitta. Pips Cucina & Wine Bar was conceived and developed by Armeni, who left liquor and wine distributor Southern Wine & Spirits of Nevada after 14 years to focus on the restaurant. The Italian restaurant’s menu features many family recipes handed down through the generations and gathered by Armeni’s mother, who traveled from Rome to see the restaurant. Pip’s joins a lineup that includes Mexican restaurant Camacho’s Cantina, Original Pancake House, T.G.I. Friday’s and the company’s own seafood and steakhouse MRKT Sea & Land, and Feast Buffet. Other amenities include a 16-screen movie theater, a food court and a pool. The hotel-casino is Station’s fifth 50-50 joint venture with the Greenspun Corp.